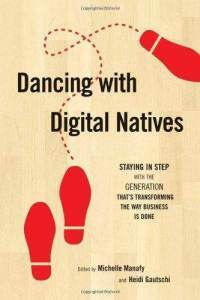 Dancing With Digital Natives: Staying in Step With the Generation That’s Transforming the Way Business Is Done , edited by Michelle Manafy and Heidi Gautschi. Medford, New Jersey, Information Today Inc., 2011. xiv, 394 pp. Michelle Manafy is director of content for FreePint Ltd., and was previously editorial director of the Enterprise Group for Information Today Inc. Heidi Gautschi grew up in France and the United States, and she continues to divide her time between these two countries. She recently finished a PhD in information and communication sciences from the University of Paris X. Their book was a USA Awards Best Books finalist for best business books in 2011. There is a gap between those who grew up before the digital age, “digital immigrants,” and had to later acquire digital skills, and those who grew up as “digital natives,” generally those born in the 1980s and later. Digital natives look at life and work through a different lens than those born earlier, and the book takes a number of angles to explore how these communities can work together as natives come to the forefront of many businesses. The writers move beyond stereotypes, e.g., digital natives know all there is to know about technology. Rather, while natives tend to be more comfortable in approaching new technology, they also have gaps in their knowledge of how to effectively use this technology. Sometimes immigrants are intimidated by natives around technology issues, but Mary Ann Bell (p. 351) challenges this notion and urges collaboration instead. So do Jami Carlacio and Lance Heidig (p. 315). Susan Evans (p. 19) moves beyond just discussing technology to examining work patterns of natives (mobile, virtual, migrant). Heidi Gautschi takes the reader away from the U.S. model, to look at digital natives in France. Christa Miller and David Hubbard (p. 61) look at the issues of managing a native workforce in the law enforcement field. This book is well edited (I know that from personal experience as my article went through many iterations). It is a vital resource for those with digital natives in their employ. The only topic that might use a bit more attention is a challenge to natives in places where their approach might need adaptation to fit into a more traditional workplace. But that is just an immigrant speaking. Business leaders and educators will ignore this book to their peril. This is a must-read.